Grassmow is not exactly what you may expect. The program is supposedly meant to provide you with shopping comparisons and produce legitimate saving discounts. Unfortunately, instead of assisting you, the suspicious browser extension assists third parties affiliated to SuperWeb LLC – the developer of the program. The company stands behind BrowsePro, KingThink, AppSuper, and other suspicious adware you should delete from the operating system. Of course, it should not come as a surprise that we recommend having Grassmow removed as well. When you install advertisement-supported software onto the operating system, sooner or later some kind of offers and ads will begin appearing on the websites you browse. Our researchers indicate that Grassmow Ads and offers Powered by Grassmow are most likely to be represented on online shopping sites, and they will keep appearing until you delete adware. It is a must to perform the removal of adware because the flooding ads may promote bogus deals and may present misleading offers. As it has been found out recently, Grassmow may be installed onto the computer with additional apps. You may initiate a bundled installer without even knowing it, and if additional ad-supported programs are installed alongside, you may need to delete even more disturbing ads flooding the browsers. Of course, you should not postpone the removal any additional threats because they may be even more intrusive and unreliable. Needless to say, you firstly need to delete Grassmow, and we can tell you how. 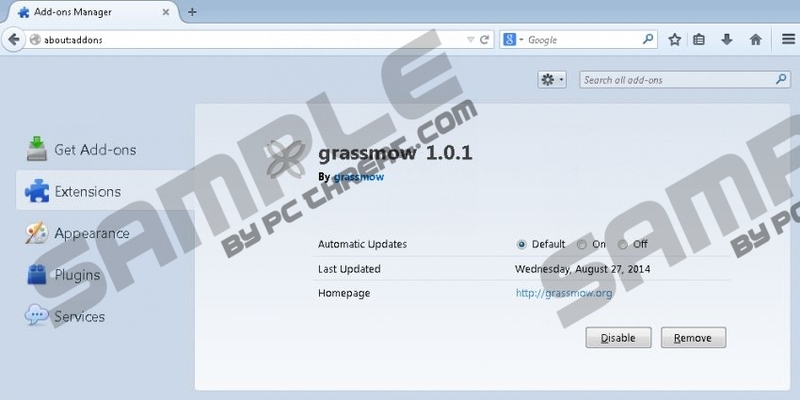 Since Grassmow is not available from grassmow.org, the program is likely to be installed bundled with applications you will need to delete. Therefore, we strongly recommend considering the installation of automatic malware removal software. If you think you can delete Grassmow and additional malware manually, complete the removal guides below and then delete the remaining components. Additionally take care of the full-time Windows security. This will ensure that malware removal does not bother you in the future. Navigate to the Task Bar and click the Start button to open a menu. Open the Control Panel and select Add or Remove Programs. Navigate to the Task Bar and click the Windows button to open a menu. Right-click the program you wish to delete and choose the Uninstall option. Right-click on the Metro UI menu and in the new pane click All apps. Now right-click the program you want to delete and select Uninstall. Quick & tested solution for Grassmow removal.